Error Messages Reported in Grid Control Local Agent Log Files. The following documentation provides instructions for installing Grid Control 11g residing on a Enterprise Oracle Linux (Version 5, 64Bit) operating system using an existing database for a repository and conforming to Oracle OFA standards. To use WebLogic Server with 64-bit JVM's on Linux and Solaris or to use WLS on other supported platforms, use the WebLogic Server generic installer listed under Additional Platforms on the Oracle WLS download page. 2. Ensure JDK 1.6 is installed. See MyOracle note 1063587.1 for details on how this is done. 3. Ensure you file descriptors are greater than 4096. 4. Check the entropy value is greater than 400. 5. Download the Oracle Grid Control 11.1.0.1 binaries from Oracle into /u01/app/oracle/software/grid11g/oms. 6. Download the Oracle WebLogic 10.3.2.1 binaries from Oracle into /u01/app/oracle/software/grid11g/wls. 10. Follow the instructions as demonstrated in the Example WebLogic Install section below. 11. Patch the WebLogic Server with patch ID WDJ7 using smart update. NB Note this may take some time to start. Be patient!! 12. Follow the instructions as demonstrated in the Example WebLogic Patch section below. 14. Follow the instructions as demonstrated in the Example Grid Control 11g Install section below. Ensure Run Quickstart is not ticked. Ensure Use HTTP Proxy is ticked. Set Host to a valid proxy. Set Port to a valid port number. Set Username to a valid username. Set Password to a valid password. Set Support ID: to a valid Metalink username. Set Password to a valid Metalink password. Ensure Yes, check for conflicts now is selected. Click on the Green Arrow Apply button. IMPORTANT - Read the following Known Issue for details of a potential bug in the installer at this point. Set Email to a Metalink username. Ensure I wish to receive security updates via My Oracle Support is ticked. Ensure My Oracle Support Password is set to a valid Metalink password. Set Proxy Server to a valid proxy server. Set Proxy Port to a valid proxy port. Ensure Enable Proxy is ticked. Ensure the proxy details are correct. Ensure Skip Software Updates is selected. Ensure Install a new Enterprise Manager system is selected. Ensure all checks have succeeded. Set the WebLogic Password to a valid password. Set the Confirm Password to a valid password. Set the Node Manager Password to a valid password. Ensure Database Host Name is set to the host name of the Grid Control Repository. Ensure Service/SID is set to the Grid Control Repository SID. Ensure SYS Passowrd is set to the sys password of the Grid Control Repository. Set SYSMAN Password to a valid password. Set Confirm Password to a valid password. Set the Registration Password to a valid password. Ensure Allow only secure agents to communicate with the OMS is ticked. Ensure Allow only secure access to the console is ticked. Take a screen shot or note down the port numbers used by Grid Control. Once the allroot.sh script has run successfully, click Ok.
Monitor the configuration assistants progress. Whilst the configuration assistants are in progress the UNIX terminal session will display information similar to the above screen. Take a screen shot or note down the URLs used by Grid Control. Please read all the known issues before continuing with the install. Alternatively, you could try the update yourself, although this will be unsupported without Oracle agreement. NOTE: Thanks to Ray Smith for this update. On some platforms it is not possible to un-tick the box I want to receive security updates via My Oracle Support. Clicking on the tick button to un-tick the box, results in the tick disappearing for a second before automatically reappearing. In effect, the installer forces the selection of the I want to receive security updates via My Oracle Support box. If the install is being carried out behind a firewall this has the unfortunate side effect of the installer hanging for a long period of time as it tries to make a direct connection to My Oracle Support. Eventually, the installer will time out and display the Choose Install Type screen allowing you to progress the install. None currently. Be patient and wait for the installer to timeout. ADDENDUM I have noticed on some platforms, that the installer will eventually time out and display the following screen. At this point it is possible to select I wish to remain uniformed of security issues in my configuration or this machine has no internet access., click continue and move onto the Choose Install Type screen. The first screen of the Grid Control Install, namely the My Oracle Support Details Screen does not allow you to enter proxy details before specifying your Metalink credentials. Therefore, having specified your Metalink credentials and clicked on the Next button, if you are behind a firewall there will be a long pause in the install whilst the installer tries to make a direct connection to My Oracle Support. Eventually, the installer will timeout and display the Connection Failed:0 screen whereby you will be able to enter proxy server details. 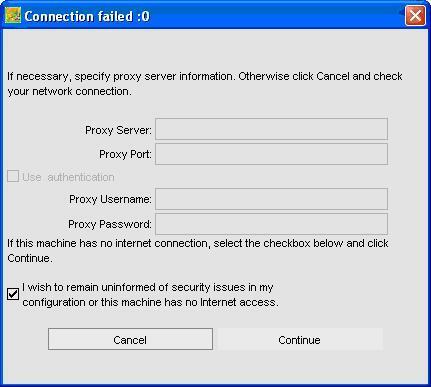 Once the Check for Updates screen has been displayed and after having setup valid proxy server details via the Proxy Server Settings button, it is not possible to click on the Test Connection button nor the Next button from the Check for Updates screen. Both buttons seem dead. Currently, the only known work around for this problem is to select the Skip Software Updates radio and then click Next. This has the obvious disadvantage of not being able to check for updates. After a clean install of Grid Control the local Grid Control agent writes a number of errors and warnings to the following logs. The following table details the errors and warnings with the proposed action required for each. emagent.trc See logfile: emagent.txt Ignore ALL messages Oracle support via an SR confirmed action. emagent_perl.trc See logfile: emagent_perl.txt If not using CRS, then ignore Oracle support via an SR confirmed action. emagentfetchlet.trc See logfile: emagentfetchlet.txt Ignore Oracle support via an SR confirmed action.